The 1-sided LP from Nmperign and Jake Meginsky is now available as a hi-res (88.2k/24-bit – more on that, later), lossless download or as an mp3, aac, ogg, what-have-you. All LP orders from http://bhobrainey.net/music/lossless will receive a free download code. I’ve sent download codes for all previous orders I have on record, but if you bought the LP from me in person, I probably need a reminder. I’ve got a pretty good memory, but it’s lazy sometimes. You’ll gradually see more stuff from me in this format – in fact, some other recent releases are also available as lossless downloads. I’ll post about the whole process when I feel there is a critical mass of new and old releases (which is not to say that you shouldn’t check out what’s up there now – these are some of my personal favorite, previously OOP releases). The savvy among you may have noticed that the host for this endeavor is Bandcamp. I’ve had a hell of a hard time bringing myself to use Bandcamp, not because of the service, which I think is flat-out awesome, but because it’s called Bandcamp. I got over it. In fact, I could have easily used a subdomain of my main web site to remove “bandcamp” from the url, but I opted to just leave it there all awkward and stupid-ironic and trivializing because a) I think what Bandcamp does is THAT good; b) I think the music can handle it. All that being said, let’s take a second and talk about 88.2k/24-bit. There’s so much crap about digital sound quality and its various parameters that people are hearing stuff that just isn’t there. So here’s a super fast lesson in sample rate and bit depth, specifically in how they relate to your home listening enjoyment (recording and mixing introduce some more complex variables, so not everything here applies in the same way). 88.2k means that there are 88,200 samples per second in this file. This number is known as the sample rate. CDs (and pretty much all commercially available and internet-ally shared mp3s) use 44,100 samples per second. BluRay can output 192,000 samples per second. Intuitively, you probably think that more samples per second equals better-sounding audio. You’re kind of right, but the question is, what gets better? The answer is: more high frequencies are reproduced with higher sample rates. A sample rate of 44,100 can only reproduce frequencies up to 22,050hz. A sample rate of 88,200 reproduces frequencies up to 44,100hz. If you’re slick, you probably already figured out that the highest frequency that can be reproduced digitally is equal to half of the sample rate. If you know how frequency works, you might also realize that even though 44,100 seems pretty huge compared to 22,050, it’s only one octave higher. You may also know that the typical range of human hearing is 20-20,000hz (and not too many people over the age of 1 really hear up to 20,000hz). There is a whole field of study called psychoacoustics that deals with, among other things, how frequencies above the range of a person’s hearing still affect perception. Still, 44,100hz is pretty high, don’t you think? So why use a sample rate of 88,200 when it basically doubles the file size and only reproduces more frequencies that people can’t hear? Well, a lot of instruments produce overtones well beyond 20,000hz, and it wouldn’t be too hard to argue that these frequencies help us perceive both the timbre of the instrument and its location in space. Also, in order to limit frequencies to half the sample rate, digital software and hardware use really steep lowpass filters to cut off frequencies above the halfway point (which is called the Nyquist Frequency, by the way). It’s okay if you don’t know what a lowpass filter is. What you might want to know, though, is that a really good, steep lowpass filter is hard to get right and that it can have side-effects like “pre-ringing” on the audio in the audible range. If you push that filter’s cutoff point well out of the range of human hearing, you pretty much eliminate the audibility of these side-effects. So, do all of your CDs and 44,100 sample rate mp3s sound like crap, now? No, they don’t. Chill out. If the music moves you, it moves you. Enjoy life and don’t worry too much about this stuff. By the way, I’m being a little simplistic, here. If you want to really know what’s going on with this sample rate business, you might want to check out this paper by Dan Lavry, who totally knows what he’s talking about. Okay, on to that 24-bit thing. The bit depth basically describes the resolution of a single sample. CDs and stuff derived from them (like all your iTunes files) use 16 bits. Most modern commercial stuff like DVDs and BluRay use 24 bits. Again, you’re all, “Bigger is better”, and I’m all, “Yeah, but what gets better?” The answer is: the dynamic range. 24-bit and 16-bit files both have the same maximum volume, but 24-bit files will reproduce softer sounds than 16-bit files – way softer sounds. Sounds that you probably don’t hear at all. 16 bits will give you a dynamic range of 96db, which, trust me, is HUGE. 24 bits give you 144db, which is GARGANTUAN. I haven’t heard any music that actually needs more than 96db of dynamic range, but the thing is, to prevent this tiny little zipper-noise distortion that you’ll pretty much never hear, you need to “dither” 16 bit files, which means that you add a little bit of ultra-quiet noise. Technically, you might want to dither a 24 bit file, but that’s kind of ridiculous. So, the advantage of 24 bits over 16 bits (in the final, delivered format – remember that recording and mixing have other variables) is basically an extremely-slightly-perceptible increase in dynamic range without any highly-unlikely-to-be-perceived dither noise. So, should you get the 88.2k/24-bit version? Yes, if you are playing the file back on a system that handles sample rates of 88.2k and bit depths of 24, or if you want the best possible version of this particular track and have the software to convert it into other formats that are practical for your set up. Does it sound better? Yes, because of the aforementioned effects of “bigger numbers” and also because there were no destructive processes applied to convert it to smaller sample rates and bit depths. Should you convert all your 44,100 files up to something higher? No way! Every sample rate conversion process, up or down, is in some sense destructive. Will the other versions of this track sound crappy? No, they sound great! Would you just chill and enjoy the music, please? What about mp3s and their buddies aac and ogg? Look, I don’t have all the time in the world, here, but let me just say that when someone tells me that mp3s “sound like crap” I think to myself, “That person is not exactly correct”. The main thing that makes these types of compressed files sound better or worse is the bit rate. A bit rate of 64kbps will very likely sound like crap. 128kbps will sound alright. 256kbps on a lot of material will sound pretty darn good. As you go higher, you get diminishing returns in terms of quality. One thing that does sound like crap, for sure, is an iPod connected to a stereo via a “Y” cable coming out of the headphone jack. The little guy just wasn’t made to do that kind of thing. Your computer’s headphone output in the same circumstances is also likely to disappoint. If you give your iPod a fancy present like this http://www.eu.onkyo.com/products/ND-S1.html and connect it to your A/V receiver that you use to watch The Dark Knight over and over again (it’s not that good, people), or, if you use a nice USB or firewire audio interface with your computer, you’ll probably feel a little less sour about mp3s and the like. Maybe that’s enough for now. Please enjoy this lovely release in whatever format you like, and don’t neglect to share. 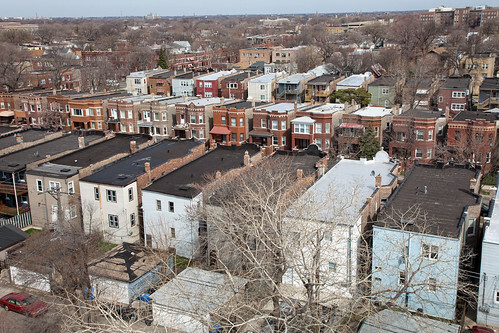 Late in the summer of 1999, I sat on a porch in Chicago’s West Side, listening to the typical sounds of an American metropolis – traffic, sirens, airborne engines, doppler’ing car stereos, stubborn insects, birds and squirrels. I brought my saxophone and some modest recording gear outside and, following an impulse that I would say was not strictly Cagean, tried to transparently enter into the rhythms and timbres of the city. The resulting recording didn’t strike me as particularly interesting, and so it was either explicitly deleted or so violently uncataloged (which was my habit with most of my recordings at the time) that it is essentially lost forever. The impulse, nonetheless, returns to me periodically, often in the form of mundane, urban field recordings into which I insert the tiniest bit of “music”, not to transform the recordings so much as enter them. My follow-through with these activities has been on the whole quite poor, and though I catalog a little better now than I did in 1999, these woefully incomplete works exist on my hard drive under consistently unhelpful titles like “Watchmen” and “Gendyn Glob”; titles usually conceived for an entirely different musical experiment that was gradually eclipsed by this recurring idea. Enter Michael Pisaro and Transparent City (Volumes 1 and 2) (and, for all I know, Volumes 3 and 4, which I’ve yet to hear). Here we have 12 ten-minute, unedited field recordings of urban environments mixed with waves of harmonically and rhythmically complementary sine tones. All of the field recordings were made in Los Angeles, but, significantly, there is no particular sonic signature placing them there. The environments are sonically mundane, and the recording quality is not distractingly good: this is not an urban version of a Chris Watson project. The sine tones are deeply integrated into the mix, and, while they could potentially act as a transformative soundtrack to the field recordings, they instead reiterate the expressiveness of the environment. It would be a mistake, however, to see that as their only function. Let me be clear that I very much enjoy Transparent City. I do not at all see it as the execution of an idea that I (and many other musicians) have had and dismissed as half-baked. I see it as perhaps one of the clearest illustrations of what is behind the recurring impulse to engage with this idea. Had the sine tones brought a new form of expression to the proceedings (creating an “alien” or “haunting” or “wistful” cityscape), then we would be speaking of different impulses. That they merely repeat the expressiveness of the landscape yet are deliberately inserted by the composer (arguably the single compositional act of the piece) makes their presence a particular assertion of will, a kind of Spinozan (and forgive me both for making this highbrow reference and for making one so common in today’s academic environment that it is nearly meaningless; it is hard not to like Spinoza) move where freedom/autonomy is asserted not in free choices but in the understanding of all that determines one’s choices: I have no choice but to choose this and so I decide that I will choose it. Whereas Cage set out to allow environmental sounds into his works, to ultimately erase the line between the work and the environment, Pisaro asserts the environment into existence. This is not an act of artistic hubris; it is not Pisaro’s environment, after all. It is a humble and profound insight into subjectivity and also into coping with sonic forces typically hostile to the quiet contemplation often associated with this type of music. A significant outcome of this compositional approach is that the (urban) listener reenacts Pisaro’s assertion by playing the disc. Surrounded by sounds one has not chosen, one chooses to introduce that same class of sounds into one’s environment. The existing urban sounds are not masked (sine tones have a way of exacerbating instances of broadband noise like traffic and refrigerators), nor is the piece permeable to the environment in the Cagean sense. Instead, playing the disc is akin to pressing play on the world itself. It is a dry, quietly monumental Yes.